The first stage of a SpaceX Falcon 9 rocket comes down for a successful landing at Cape Canaveral Air Force Station on June 3, 2017. A series of spectacular photos chronicles the big day SpaceX had over the weekend. A SpaceX Falcon 9 rocket launches a pre-flown Dragon cargo capsule from NASA’s Kennedy Space Center on June 3, 2017. About 2.5 minutes after liftoff on Saturday, the Falcon 9's first stage separated, then began maneuvering for a trip back to Earth. About 5 minutes later, the booster made a pinpoint vertical touchdown at Landing Zone 1, a facility at Cape Canaveral Air Force Station, KSC's next-door neighbor. A SpaceX Falcon 9 rocket carrying a used Dragon cargo capsule streaks into the sky above NASA’s Kennedy Space Center on June 3, 2017. 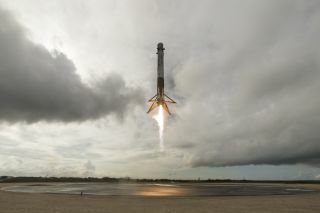 These activities are part of SpaceX's effort to develop reusable spaceflight systems, a key priority for company founder and CEO Elon Musk. Full and rapid reuse of spacecraft and rockets will slash the cost of spaceflight, potentially making Mars colonization and other grand exploration feats economically feasible, Musk has said. "It's starting to feel kinda normal to reuse rockets. Good. That's how it is for cars & airplanes and how it should be for rockets," Musk tweeted Saturday. The nine Merlin engines on the first stage of a SpaceX Falcon 9 rocket power the company’s Dragon cargo capsule toward orbit on June 3, 2017. The Dragon that launched Saturday reached the ISS today (June 5), delivering about 6,000 lbs. (2,700 kilograms) of scientific experiments, hardware and other gear to the orbiting lab. The capsule will stay attached to the station for about a month, then return to Earth for a soft, ocean splashdown. The Falcon 9 first stage touches down at Cape Canaveral Air Force Station on June 3, 2017. This particular Dragon also visited the ISS once before, back in September 2014. Each Dragon can probably safely fly about four missions to and from the ISS, Hans Koenigsmann, SpaceX's vice president of build and flight reliability, said during a press conference Saturday. SpaceX's Falcon 9 rocket stage is seen safely on its Florida landing pad with the trail of its fiery descent visible in this amazing long-exposure photo taken June 3, 2017 after the booster launched a Dragon cargo ship to the International Space Station for NASA. Each Falcon 9 first stage is designed to fly 10 times with no hardware changes, and at least 100 times with only moderate refurbishment, Musk said in late March.